The center of commerce for the operations, the Company Store is literally at the crossroads of Long Pond Ironworks. The ruins, shown in the lower right image, are the remains of the Company Store which may have been the original store built here in the 1760's and then rebuilt in the 1860's. This is where everyone in the village shopped and conducted business, all the records were kept here and this became the first Post Office in Hewitt. This was a company town, if you lived and worked here for the company, you got to live in company houses, your children went to school in the one-room school provided by the company and you did your shopping in the company store on a credit basis which meant that you rarely saw much actual cash, you "owed your soul to the company store." Directly across from the store was the weigh station where all loads coming and going through the village were weighed. The weigh station operated much like a modern truck stop scale that you see on today's highways. 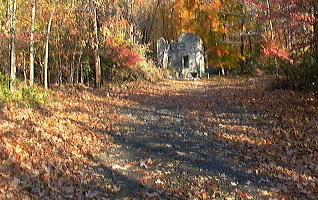 The road up past the Company Store leads to the furnace bank. It is in this direction that all raw materials for use in the furnace would pass on up to warehouses and eventual use in making iron. The other road off to your right leads to the actual ironworks complex. So this quiet area was once the center of a bustling industrial community. There was an almost continuous line of wagons coming through here bringing iron ore from the mines, limestone from up in Sussex, charcoal from out in the woods as well as other market goods used here in the village. 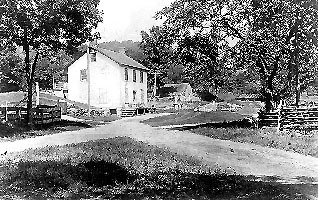 Wagons had to be weighed, a blacksmith shop stood off the intersection towards,what today is, the Monksville reservoir and wagon parts or harnesses were repaired there, people would be shopping in the store, the place was very busy. Your tour is divided into four legs.